Simply thaw your pets’ meal portion at room temperature for 10-20 minutes or in your refrigerator overnight in a covered container. Raw frozen nuggets will retain optimal freshness for 3-5 days under refrigeration. Puppies and lactating females: divide daily portions into 3-4 meals daily – Adults and seniors: divide portions into 2 meals daily. To transition your pet to a raw diet, start by gradually reducing the current diet by 1/4th and replace with 1/4th the feeding suggestions for your pet of thawed diet, or feed them as a separate meal. Gradually increase the portion of raw frozen and reduce the current diet over 7-10 days or until the transition is complete. Northwest Naturals can also be used in addition to your pets current diet as it provides bio-available nutrients for optimal health. Use Northwest Naturals as a meal topper or substitute for one meal a day. See packaging or our feeding calculators for amounts to feed. Raw Frozen recipes contain fresh whole foods and may vary in size and color. 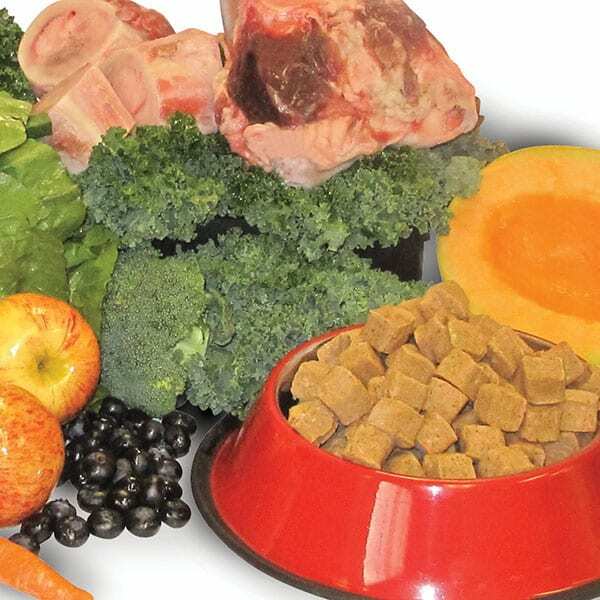 Feeding Guidelines are approximate and may vary as every pet has different metabolic requirements. Our feeding guidelines are based on your pet’s weight, age and activity level. Calculations are approximate. Enzymes: Enzymes are a catalyst for all processes in the body such as cell growth and breaking down nutrients during digestion. Enzymes are made of proteins and proteins are very easily affected by heat, pH and heavy metal ions. Most food enzymes are essentially destroyed under the conditions used to cook and process food, leaving foods devoid of enzyme activity. Enzymes are denatured when heat is applied. Amino Acids: Amino acids form the proteins that in turn form muscle tissue and increase fat metabolism. There are two types of amino acids; essential amino acids and nonessential amino acids. Dogs and cats cannot make essential amino acids and so must obtain them from raw foods. Intracellular Moisture: Intracellular moisture, also called cytosol, is the liquid found inside cells. Intracellular moisture is the most effective way for your pet’s digestive system to break down and process their food. Without the moisture from prey animal cells, the digestive system has to work extra hard to complete the digestive process. When cooked, plant and animal cells lose this natural moisture. Every batch of Northwest Naturals™ raw natural pet foods for dogs and cats that we make has a minimum of 6% fresh ground bone added. Fresh ground bone is a great source of natural calcium for your pet’s health. Most manufacturers do not use fresh ground bones because bones are hard to grind. Instead they use powders of calcium and phosphorus. How hard are bones to grind? Very hard. We tested several different pieces of equipment with motors of up to 150 HP to try to break bones down prior to grinding. Smoke, steam, and loud noises is about all they would produce. Major grinding equipment companies will not warranty their equipment for bone grinding operations. What does Northwest Naturals™ use now? We use all steel heavy duty frozen block meat grinders turning at very slow rpms to break bones down into even smaller pieces. Our procedure for grinding bones is: The 1st machine will break the bones into pieces about 2-3″ in size. The 2nd machine breaks the bones into 1/2 -1″ pieces. The final machine grinds the bones through a stainless steel plate with holes that are an 1/8″ diameter. Soft cartilage tissue that is attached to hard bones can squeeze and flex through a 1/8″ hole and then expand to slightly larger than 1/8″. Fresh ground bone pieces at 1/8″ or less are easily digestible for your pet’s natural nutritional health. Why does Northwest Naturals™ use fresh ground bone? Because it is the only correct way to give your pet natural and balanced calcium in their diet. Why do so many other manufacturers not use fresh ground bones? Because bones are very hard to grind – because the equipment for bone grinding is very expensive -and because adding a synthetic powder is easier and cheaper.